Make it Shoji's and enjoy Teppanyaki" an ancient style of cooking in which the chef prepares prime cuts of beef, chicken and seafood together with rice and fresh seasonable vegetables in front of you and cooks by grilling on a large steel hotplate called a "Teppan". In Japan "yaki" refers to ingredients that have been grilled, hence "Teppanyaki". At Shoji's your Personal Chef has trained for years to delight your group with a exciting performance of knife skills, antics and delicious teppanyaki cooking right before your eyes. Shoji's presents a clean, casual but classy atmosphere, decorated in rich Asian hues making the perfect backdrop for a romantic dinner, celebrating a birthday with a loved one, or a fun night out with friends. Watch the kids, wide-eyed in awe, when they first witness the flames. 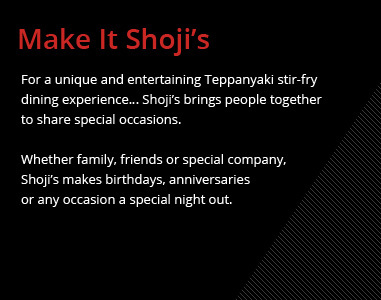 Make it Shoji's and enjoy a unique and exciting dining experience, hear the laughter and merriment while enjoying the chef's skillful and entertaining show.